Shin splints are a common lower extremity complaint, especially among runners and other athletes. They are characterized by pain in the front or inside aspect of the lower leg due to overexertion of the muscles. The pain usually develops gradually without a history of trauma, and might begin as a dull ache along the front or inside of the shin (Tibia) after running or even walking. Small bumps and tender areas may become evident adjacent to the shin bone. The pain can become more intense if not addressed, and shin splints should not be left untreated because of an increased risk of developing stress fractures. Shin splints usually involve small tears in the leg muscles where they are attached to the shin bone. The two types of shin splints are: anterior shin splints, in the front portion of the tibia; and posterior shin splints, occurring on the inside of the leg along the tibia. Apex shoes are constructed with innovative materials and design, making these the best shoes for preventing shin splints. 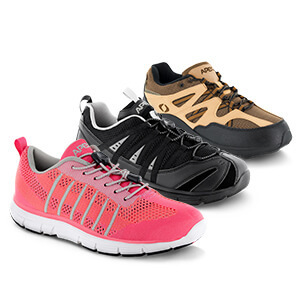 Each shoe features superior shock absorption to reduce impact on the lower leg muscles when running or jogging. In addition, Apex shoes provide biomechanically-contoured arch support to prevent over-pronation, which can exert undue strain on the lower leg muscles. Finally, each shoe includes a set of two removeable inserts to accommodate prefabricated or custom inserts and that help achieve the perfect fit. For additional relief, Apex has developed the most innovative suite of prefabricated orthotics available anywhere. Shin splints can be caused when the anterior leg muscles are stressed by running, especially on hard surfaces or extensively on the toes, or by sports that involve jumping. Wearing athletic shoes that are worn out or don't have enough shock absorption can also cause this condition. Over-pronated (flat feet) are another factor that can lead to increased stress on the lower leg muscles during exercise. People with high arched feet can also experience shin splint discomfort because this foot type is a poor shock absorber. The best way to prevent shin splints is to stretch and strengthen the leg muscles, wear footwear with good shock absorption, and avoid running on hard surfaces or excessive running or jumping on the ball-of-the-foot. Insoles or orthotics that offer arch support for over-pronation are also important. Treatment for shin splints should include taking a break from the exercise that is causing the problem until pain subsides. Icing the area immediately after running or other exercise can also be effective, along with gentle stretching before and after training. Another option is taking aspirin or ibuprofen to relieve pain and reduce inflammation. It is important not to try to train through the pain of shin splints. Runners should decrease mileage for about a week and avoid hills or hard surfaces. If a muscle imbalance, poor running form or flat feet are causing the problem, a long-term solution might involve a stretching and strengthening program and orthotics that support the foot and correct over-pronation. In more severe cases, ice massage, electrostimuli, heat treatments and ultra-sound might be used.